Flip-It! bottle emptying kit. No more waste! Match the Adapter to the bottle, screw it into the base cap, and then onto the bottle. Flip-it! and within moments the product will arrive at the opening, ready to come out. Insert a 38mm gasket into a Purple base cap. At this point, the base cap is ready to be used on its own for any standard 38mm bottle (example Honey, Mustard, Maple Syrup, Gallon bottles of Soap, Car Wash, etc..) No Adapter required; simply screw directly onto the bottle, flip, and within moments the product will arrive at the outlet, ready to be used. A little beyond “hand tight” is sufficiently tight. Like most people, you will have bottles with smaller necks than 38mm. Choose the correct Adapter for the standard 33mm (chocolate syrup, large shampoos/conditioners, some salad dressings, most dish gels, etc…) 28mm (maybe the most popular: skin lotions, sunblocks, most shampoos/conditioners, etc..), or 24mm (smaller pump bottles, smaller lotion bottles, liquid soaps, etc..) bottle you want to use, insert the corresponding gasket into the Adapter, and screw the Adapter into a Purple base cap. Hand tight is enough for now. Now attach the Adapter/Base cap combination to the bottle, screw on a little beyond “hand tight”, flip, and within moments the product will arrive at the outlet, ready to be used. Pick up the bottle and with your other hand, gently pull the valve down to open. Squeeze the desired amount of contents out, and press the valve back up to close. Optionally, the act of firmly placing the bottle back down on a firm surface will cause the patent pending valve tip to close on its own. If for whatever reason the valve is not closed, most bottles will automatically topple over, your cue that the valve is not closed. The Flip-It! can remain on your bottle as long as you need it to. Once the bottle is emptied, remove the Flip-It, disassemble, remove all gaskets, and repeat the cleaning process. The Flip-It! is then ready to be used again. 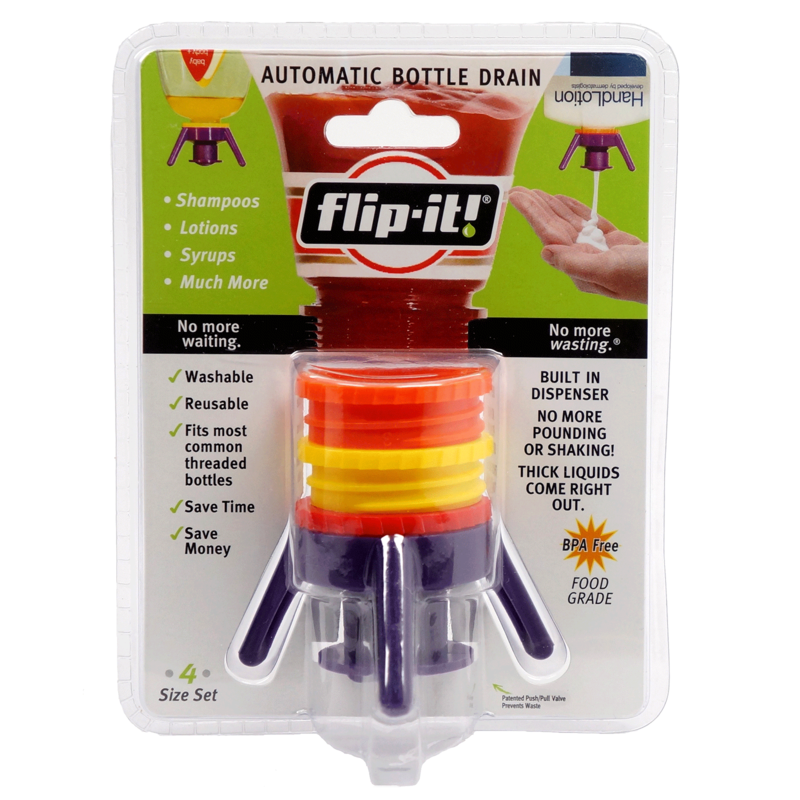 The simple Flip-It!® cap system allows you to support your bottles of product upside down so that gravity pulls the product to the opening, and as soon as you need product, its waiting for you, instantly ready to come out.